The environmental experts of JSC “Latvijas valsts meži” in a regular bird monitoring survey at the LVM West Vidzeme region have found a new nest of a protected bird – osprey. It was found in a retention tree which has been left in a clearcutting – in a pine – which ospreys often select as a location to build a nest. It was found that 32% of all nest occupied by ospreys last year were in retention trees. “It is interesting that the new nest is only 10 metres away from a road. Ospreys are tolerant to disturbances that are created by cars passing the nest, it has been confirmed also by other successful close to road nesting examples. Osprey begins to worry only when a car has stopped close to nest and a human has stepped out of it,” says Aigars Kalvāns, the environmental expert of LVM. The annual bird monitoring, during which osprey chicks are being counted, weighed and ringed, allows evaluating the success of bird nesting. During the year 2018 monitoring, the population of ospreys was re-evaluated. At the moment 210 to 230 osprey couples are nesting in Latvia. It is 5% more than three years ago. 153 osprey nests were surveyed – it is the largest number of occupied nests in one year. During the monitoring, 15 new previously unknown nests were found, 12 of them are located in territories managed by the LVM. “After analysing monitoring data about the last 30 years, it was established that the population of osprey has increased almost five times,” explains environmental expert of LVM, pointing out that approximately 80% of all osprey population in Latvia are nesting in territories managed by the LVM. An impressive number of rare and protected species nest in the territories of LVM, for many of these species the largest part of their population live exactly in the forests managed by the LVM, for example, the LVM forests are home for all six eagle species that exist in Latvia – golden eagle, white-tailed eagle, osprey, lesser spotted eagle, greater spotted eagle, short-toed snake eagle, black stark, and also Western capercaillie. LVM environmental experts perform bird monitoring regularly to obtain information about better living conditions for bird species, and also in line with the environmental aims of LVM, to reduce the impact of forest management on the living conditions of rare and protected species. Monitoring allows following whether the environmental aims are reached and, if necessary, justify changes in the practice of forest management to reduce the impact on environment. 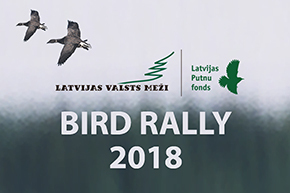 In connection with birds, the results of monitoring show the dynamics, development trends and the total number of bird species in Latvia.